I love the Droste Effect. Look closely at these smartly – styled glasses. Look as long, as hard as you please… and you won’t see the Nickel they contain. It’s right before your eyes, too… in the frames (mountings, some people call them). But you don’t see this Nickel. You see the precious metal that surrounds it — gold, in this case. But take these glasses in your hand … watch them in use… and, though you don’t see the Nickel, you do see what it does. Mostly, this is due to Nickel, “Your Unseen Friend.” That helps explain why Nickel is frequently added to other metals. It shows you some of the advantages Nickel gives other metals. Advantages that make these metals more useful to you … advantages that would be lacking without Nickel… advantages that are out of all proportion to the small percentage of Nickel used! Because of these advantages, Nickel has a well-recognized place in conserving eyesight throughout the profession. It’s used in practically all professional equipment—diagnostic instruments, examining instruments, sterilizers. It’s the “backbone” of most glasses. It’s the optical manufacturer’s “Unseen Friend” in many different ways. The Romance of Nickel is the name of a booklet that tells, in word and picture, the story of Nickel, and how Nickel is used to make life easier and more pleasant. It tells many little-known facts that make interesting conversation. You’ll really enjoy reading it. For a free copy, write The International Nickel Company, Inc., Dept. 376z, New York 5, New York. Nickel is a very useful metal – one of its latest starring roles is in nickel metal hydride rechargeable cells – but I think “The Romance of Nickel” is putting it a bit strong! 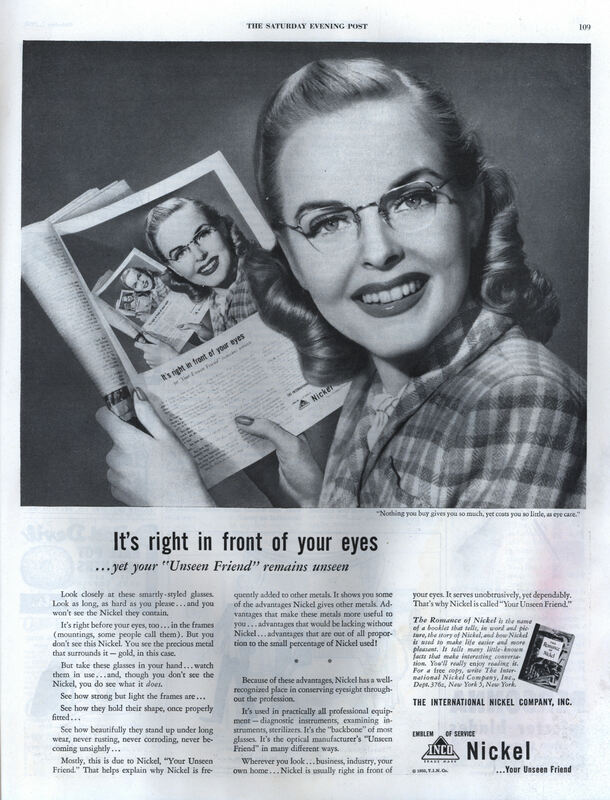 Ads for industrial products and materials, aimed at ordinary Joes and their house wives, running in general circulation magazines… what a weird idea! I’m going to write in for a copy of that booklet “The Romance of Nickel.” Just in case there are still some left. 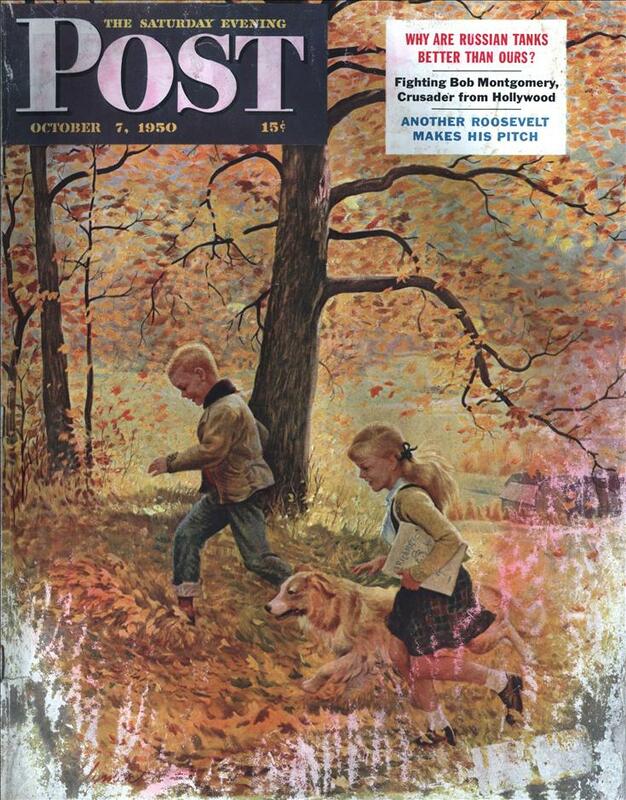 Could the Saturday Evening Post have been strong-armed by the Nickel lobby? Maybe a money laundering scheme? “Don’t send the money to me, it could be traced. is destined to appear in? I happen to be allergic to nickle, I cannot wear jewelry or watches as contact with the metal causes me to break out in blisters. This may be one of the last instances of “romance” being used to mean “heroic prose narrative” instead of “love story”. INCO’s home town, Sudbury, used to look like a bad part of the moon, but on the bright side they did slag dumping at night which was fun to watch. Sort of like a local, well scheduled, volcano. JMyint: Do US 5-cent coins cause you problems? According to Wikipedia, “nickels” are in fact 25% nickel. @GaryM: people with nickel allergies don’t usually react to momentary handling of items. The reaction usually occurs when the item is held next to the skin for some time. Some of the pictures at the Johns Hopkins DermAtlas website are disturbing, to say the least. I don’t have problems with “Nickles” but I do have problems with things like buttons on pants and belt buckles. My eyeglasses were giving me a fit until I painted the frames with clear nail polish. Ya know I should read what I type more often. I have just been letting my fingers go on auto-pilot and mis-spelling nickel. The recursive ad is cute. Nickel is nice, but it can’t hold a candle to Zinc!